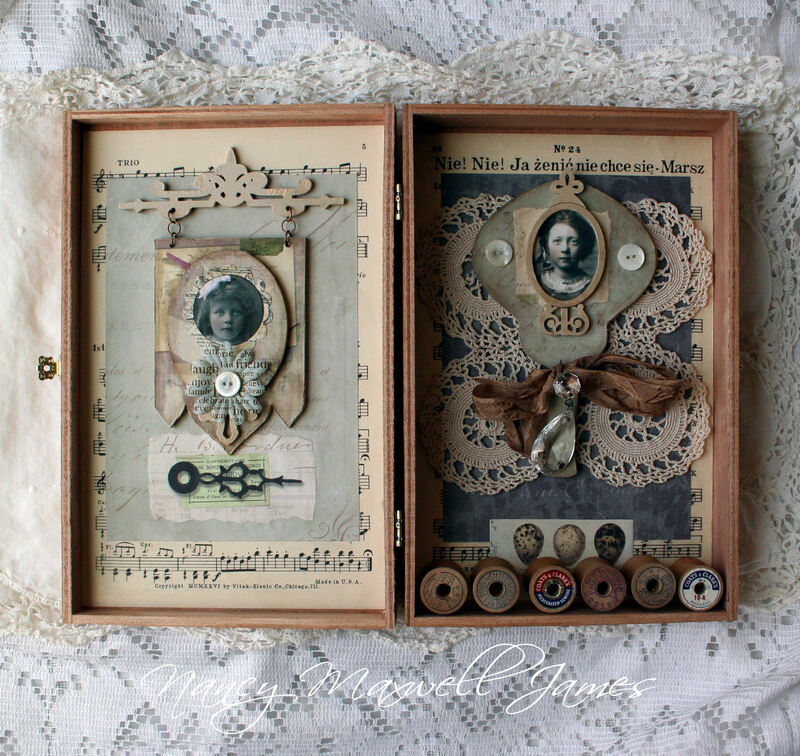 My muse for the Paper Whimsy Inspire project this week came from my love of antiquities and romance. I envisioned the project to be something a vintage lady may have on her bureau or the contents of the drawers where she kept treasures. I selected a soft and muted palette for my color scheme with just a hint of mauve, dusty purple and soft greens. (1) I select a plain cigar box to construct my project within. The box measures approximately 11 inches tall by 7 inches. On the interior of the box, I added old sheet music and layered pattern papers in different widths using matte gel medium. I then added the Beautiful faces to the center of each piece. (2)A old crocheted vintage doily was added to the center and random wooden thread spools to the bottom of the box. I glued these all in place with E6000. (3) The Alterables were painted in a warm beige craft paint and then I applied the pattern paper over each using matte gel medium. Once the paper had dried onto the piece I went in with a craft knife and tiny scissors to trim away the access. The edges were softened using the Pan pastel along the edges. (4)I attached a piece of seam binding and the old crystal prism to the bottom of the Fancy Paddle fan because I wanted it to resemble a vintage hand mirror. I also attached copper jewelry rings to the Fancy Banner. Little old fashioned buttons were added to the side and interior of the box as well. What a beautiful and charming project. All the wonderful mementos you’ve included, makes it seem like a real ladies’ treasures. Not only is this beautiful to look at but it goes so much deeper as it touches the heart. 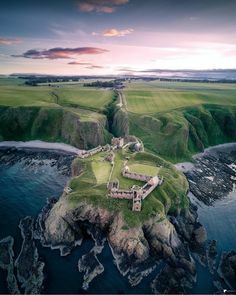 There is a story being told with the elements you gathered together, a story from the past. With all you create it is so obvious that you treasure the past, the stories contained within items, even the most ordinary of items such as thread spools. Simply adore all the elements especially that darling vintage hand mirror! 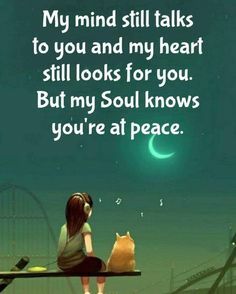 Hello Nancy, I hope you are doing well. Your altered box art here is vintage goodness! I love the layering of papers and doilies. The alterables really add dimension and extra interest to your composition. How fun! Nancy this is truly inspirational! Love all the different elements – new and vintage that you have used along with the PW alterables and sweet images! How kind of you to share your process with us all! 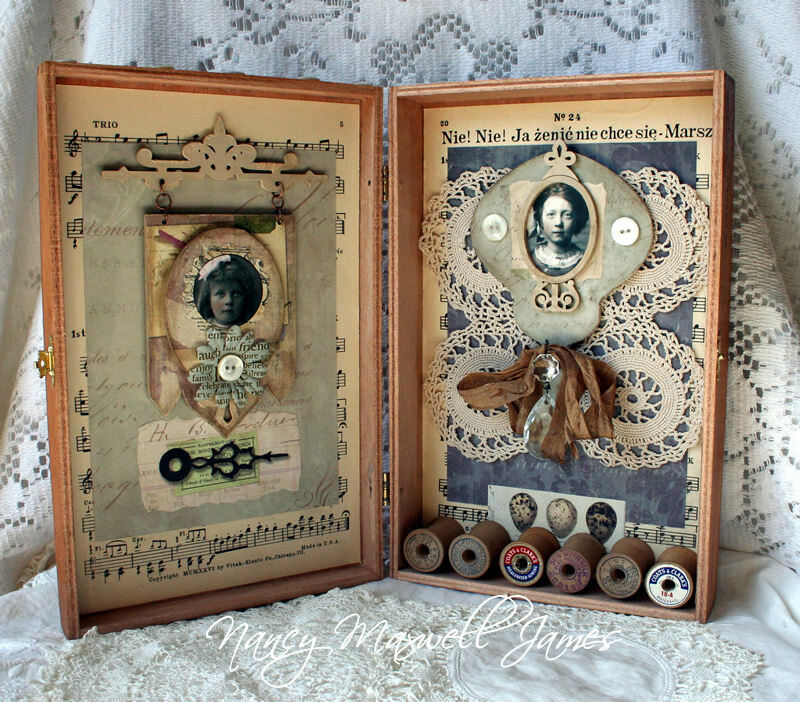 Gorgeous box Nancy-love the spools lined up on the bottom, and a great idea using that one alterable as a mirror! 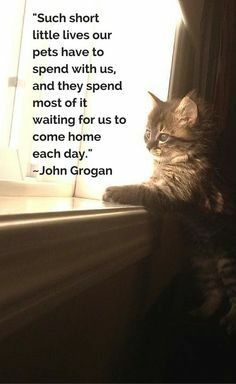 Lovely and sweet! I especially love the use of the spools. Bravo once again, dear Nancy!!! You are really inspiring! Nancy it is so inspiring to visit your blog and see your newest creations, the cigar box is so beautiful and creatively made, Happy Easter. My dear Nancy, this is a most beautiful and so lovely art piece. You alwayes find such wonderful old items to add to your fantastic creations, and this one in it`s soft low colours ,with the feeling of old charm and beauty, is so adorable . 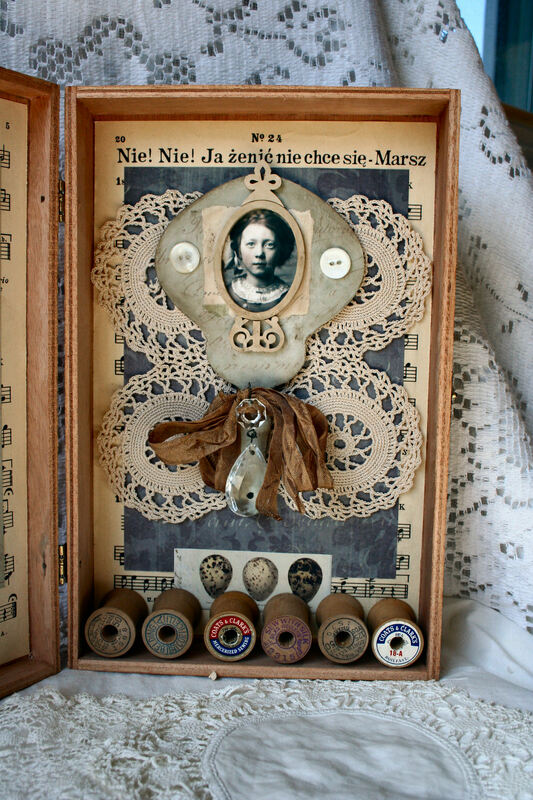 Your altered box is a real treasure, dear Nancy. A gorgeous composition. Oh this is so smoking! OK, so you know I am a silly pea shooting fool! 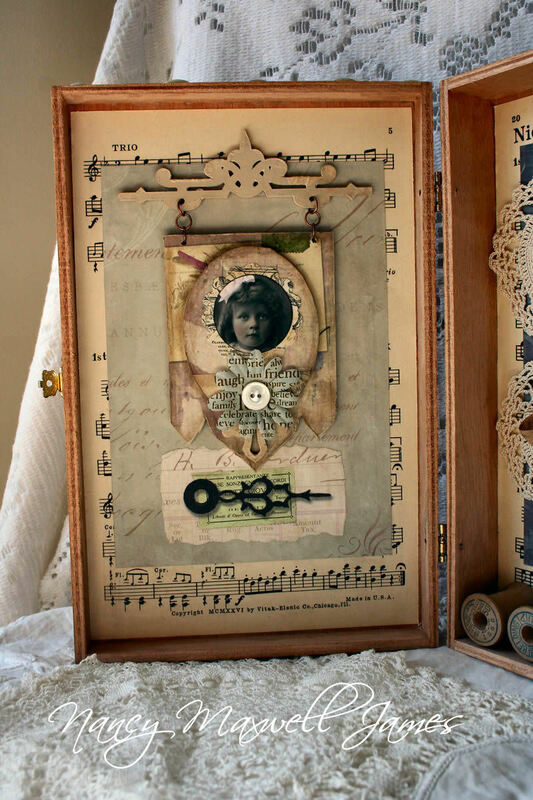 Love this altered cigar box and all the lovely details! I am working on one that I tried to stand like that, but no luck. This is beautiful, Nancy! Hugs! This is a lovely box of creative bliss. I just saw your boxes on Pinterest. Fantastic. These are really special.